An illustration of ESA's proposed Hera spacecraft scanning the moon of the asteroid Didymos with a lidar instrument. RENTON, Wash. — A year and a half after ministers declined to fund one mission to an asteroid, the European Space Agency is working on a second such mission that could support planetary defense efforts. The European Space Agency announced June 25 that a proposed mission called Hera has entered its next stage of engineering development. The spacecraft would fly to the asteroid Didymos, arriving there in 2026 to the study it and a smaller moon, informally named "Didymoon,"orbiting it. However, at ESA's most recent ministerial meeting in December 2016, member states declined to fund AIM. "At the end of the day some of the member states decided to put their money into other projects," said Jan Woerner, director general of ESA, in a June 29 phone interview after participating in a media event for Asteroid Day, an event intended to highlight the impact threat posed by asteroids. Woerner said he believed ESA did not do enough to convince member states to support AIM. "Last time, we developed the AIM mission internally, and then we gave the information to our delegations," he said. That information, he said, was provided to the delegations about two months before the meeting. "This time, we are doing a totally different approach," he said. "Since the last ministerial in 2016, we are raising awareness to politicians of the possible danger of an asteroid impact. By doing that, we will change the narrative." He added ESA will provide the formal proposal for Hera to governments at the beginning of 2019, nearly a year before the next ministerial meeting. Woerner said Hera will be part of a broader "space safety" initiative for which ESA will request funding. Other elements of that program include space situational awareness and monitoring of space weather. The spacecraft itself will be similar in design to AIM and equipped with a camera that is a flight spare of an instrument developed by the German space agency DLR and used on NASA's Dawn spacecraft. It will also carry a lidar and hyperspectral imager, and use its communications link with the Earth as a radio science instrument. While Hera won't be able to observe the impact, it will characterize Didymos and its moon after DART's impact. "We cannot observe the impact itself, but we can observe the consequences of the impact," Woerner said. That includes imaging the impact crater on the moon and changes to the moon's orbit and its rotation, which can help scientists determine how efficient the impact was in transferring its energy to deflect the moon. 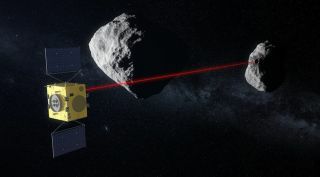 DART and Hera, he said, "are basic investigations and technology development" that can support any planetary defense missions that may be required in the future. "It's all preparatory work," he said. ESA is not involved with the DART mission itself, Woerner said. NASA's plans for DART remain largely unchanged despite the lack of the companion AIM spacecraft. Lindley Johnson, head of NASA's planetary defense coordination office, said in a June 20 media teleconference that DART should soon be confirmed for full development and launch in mid-2021. NASA requested $90 million for DART in its fiscal year 2019 budget proposal. While AIM will not be present to observe the impact, NASA is in talks with the Italian space agency ASI to fly a cubesat dubbed "SelfieSat" with DART that would separate from the main spacecraft and observe the impact as it flies by.